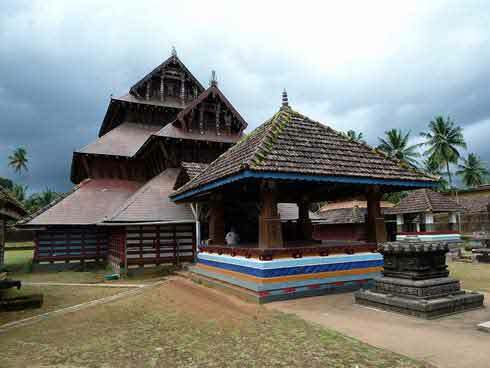 Adoor Mahalingeshwara Temple, located at Adoor in Kasargod in Kerala, is dedicated to Lord Shiva. The temple was founded by Arjuna of Mahabharata. The temple is associated with the Kiratha Yudham – disguised Shiva as hunter taking on Arjuna and blessing him with arrows. This story is carved on the valiya bali kallu in the temple premises. Shiva is worshipped here in the form of a Shivling. The Nandi in the temple is in standing posture. The murti of Nandi is found in the namaskara mandapa. The subsidiary deities worshipped in the temple are Mahavishnu, Ganapathy, Sastha, Kinimani, Poomani, and Raktheswary. The architecture of the temple is unique – it is a three-tier temple and the temple resembles the backside of an elephant. 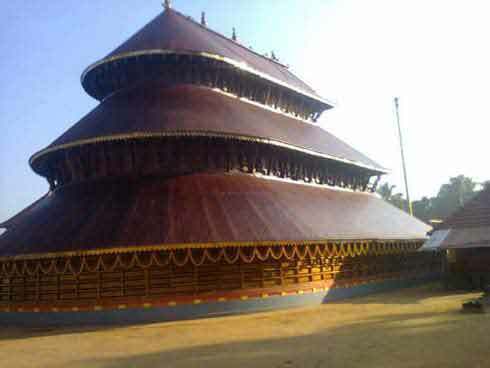 The temple is a Mahakshetra, (big temple with all essentials) – it has a namaskara mandapa, tidappally, valiya ambalam, agrasala, pond and flag post made of copper. The walls of the ancient temple are adorned with colorful paintings of Ganapati and Shasta and the roofs are exquisitely carved with the scenes from Hindu stories. Makar Sankranti is of great importance here. It is believed that the Shivling was discovered on a Makar Sankranti day. Sahsra Kumbha Abhishekam and Anandam ceremony are held on the occasion. The annual festival in the temple is observed in March month. It begins on the 27th day of Kumbham month as per traditional Malayalam calendar and ends on the 4th of Meenam month. The temple is around 41 km east of Kasargod on the banks of Payaswini River.